Car rental in Gangtok by Fab Cab is perfect for travellling Gangtok and wish to enjoy beautiful sights in Sikkim. Gangtok is the one of the best tourist attraction place which has Buddhist pilgrimage. Sightseeing of Himalayas is very attractive and beautiful. We have wide range of luxurious and economic vehicles like Indica, Scorpio, Vista, and Aria for traveling different places in Gangtok and even opt for some short tour. We make sure all our vehicles are updated and clean so that our customers are comfortable and do not face any problem. Now there is no need to search for local car services to rent car. Gangtok Car Rentals by Fab Cab offers carsat the price that you can easily be afforded by all. Car rental in Gangtok by Fab Cab will make it easy to enjoy beauty city across Sikkim with ease. Sikkim is in Himalayan mountains which is one of the reasons that every year many tourists consider it for having a vacation with family and friends. People who visit this hilly area are in need of car services which helps to enjoy the city without any trouble. Fab cab is offering cars to build a strong relationship with customers and so ask for tour report which can help them to improve their services. They always try to improve services so that the customer can never have any complaint with services. Now there is no need to search for local car services to rent car. Car rental in Sikkim by Fab Cab offers carsat the price that you can easily be afforded by all. So, now there is no need to take tension as car rental services in Sikkim by Fab Cab will make it easy to enjoy beauty of city. Sikkim car hire services offer all luxurious vehicles which can suit your budget and requirement. The cars which they offer are fully air-conditioned and spacious. The car is offered for different packages and tour. It will help to cover all areas which are mentioned at time of booking. Tour packages are best as it gives the option to save time and money. They have the best chauffer’s who are well trained and skilled. They are having a great experience which makes them work very smoothly. Thus you can easily rely on them and are tension free that you are in safe hands. Gone are the days when renting a car is counting among the tedious task of the time. Now, the anticipated service for you is just a click away from your end. Finding a cab in the area like Gangtok is now possible by Fab Cab and all other requirements can also be mentioned at time of booking itself. Special packages are available to cover nearby places and chauffers having knowledge about demography can take to any place easily. Couples and families are able to book car according to members of family itself. One can have 2 seaters or even 6 seaters car accordingto their choice and budget. Online booking for car rental in Gangtok will give an option to book car before actually visiting city. Quotations are available online so that customers are able to book car according to it.Secure payment gateways are available to carry out transaction. Sikkim taxi rental services are always available for booking and online services have made it easy for all. If you have decided some sight-seeing before booking it could be mentioned at the time of booking to enjoy services. They even have a helpline number which is always available for us. So grab the best deals for car rental in Sikkim by FabCab to explore beautiful Sikkim on road trip. Sikkim can be explored with help of such experienced chauffer’s as they are aware of all roads and worth watching. As a result, one can have a memorable time with car hire in Sikkim services offered by Fab Cab, which also happens to offer its services in Siliguri, Darjeeling, Bhutan and Nepal. Nice and loving trip familiar with my whole family the trip was so excellent driver also so nice with us in every tour we are so excited when we got the Nathula pass for the tour thanks alot to fab cab tours. I would personally recommend FabCab to everyone for cab hire and car rental. I loved the services and pricing was affordable for car trip in Sikkim. I also believe Sikkim is blessed with beautiful places. 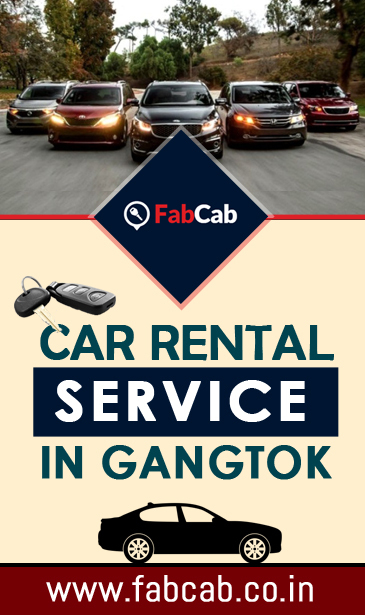 Fab Cab is a car rental company based in Gangtok, the capital of Sikkim. We provide transport at very affordable price.